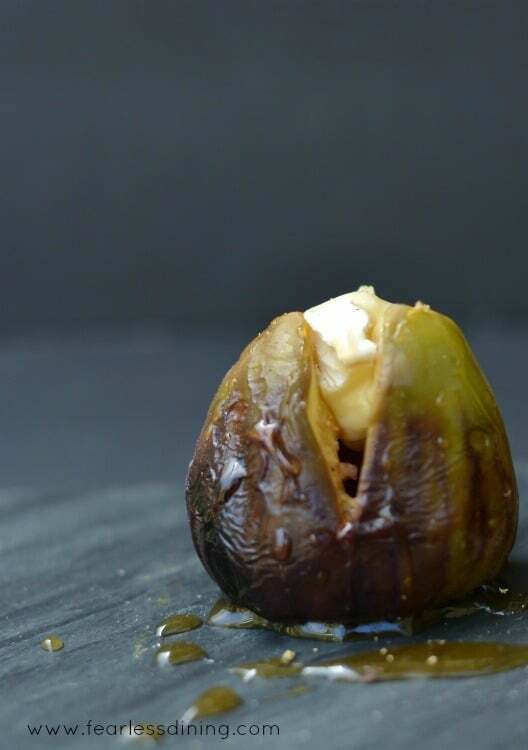 Fresh figs are in season, and I want to share with you a new way to enjoy them. Toss your figs on the grill! They make an incredible brie stuffed grilled figs appetizer! Just drizzle on some honey and serve them up. Have you ever grilled fruit? How about grilled figs? I saw a photo on Pinterest last week of a slice of grilled watermelon that really caught my eye. At first my mind couldn’t wrap around the concept of cooking watermelon, or any fruit for that matter. I love these grilled banana gluten free whoopie pies! Questions raced through my mind…did the heat destroy or add to the flavor of the watermelon? Did the char marks change the watermelons taste? How would brie stand up to the grilled fruit sweetness? My kids wondered how do you grill fruit, so we grilled these figs together. I almost had to wrestle the brie away from my daughter for this recipe. She LOVES brie and didn’t want to let us use it in this appetizer recipe. Figs come in many different colors and varieties. I had a box of brown figs sitting on the counter that were about to spoil, making these the perfect fruit for us to experiment with. This recipe will work with any variety of fig. There is something magical about brie and figs. The gooey brie cheese flavors just mesh with the sweetness of the figs and honey! These figs look beautiful on the grill. I kept the lid open and grilled them slowly so they wouldn’t burst. lightly brush with organic cold pressed olive oil to prevent burning. When they looked like they had softened, I brought them inside. Carefully make two deep cuts from the top down. Insert a small chunk of brie. the heat from the figs helped soften the brie even more, melding the flavor into the figs. Next, I drizzled honey and then sprinkled some cracked pepper on top. These figs would be a perfect appetizer if you need a fancy dish for a party. The verdict: grilled figs were delicious and I can easily see grilling figs in my future. The flavors really work well together. Here is our little fig tree. Another month and we should have our own fresh figs. Check out all of the appetizer recipes on this blog! Wooden or metal skewers for grilling the figs. Tongs to pull the skewers off the grill. Preheat your grill and make sure the surface is clean. Press the figs onto the skewers. Grill until softened with the lid on the grill up so they don't overheat and burst. When cooked, bring them inside and let cool for 5 minutes. Make + shaped cuts from the top down midway into the fig. Stuff with the brie cheese. Drizzle honey and then sprinkle cracked pepper on top to taste. 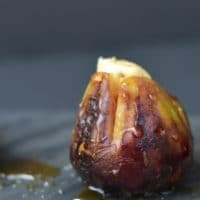 More Yummy Fig Recipes to Try! If you are looking for more appetizers, try these Delicata Squash Stuffed Mushrooms! How delicious and sophisticated! Perfect with a glass of wine. Pinned! Thank you so much…they are perfect with wine :-). Oh how I wish we had figs in Minnesota! I’ve seen them in Whole Foods every now and then but they just don’t grow up here. These figs are out-of-control awesome. LOVE! Thank you Lauren….I wish they were more hardy I would ship some your way 🙂 They are pretty soft and would end up mush by the time they got there. What a great experiment! It is so wonderful how the brie melts right into the freshly grilled figs and the addition of honey makes for a delightful flavor combination. Thank you for this delicious recipe and all of the lovely fig photos. 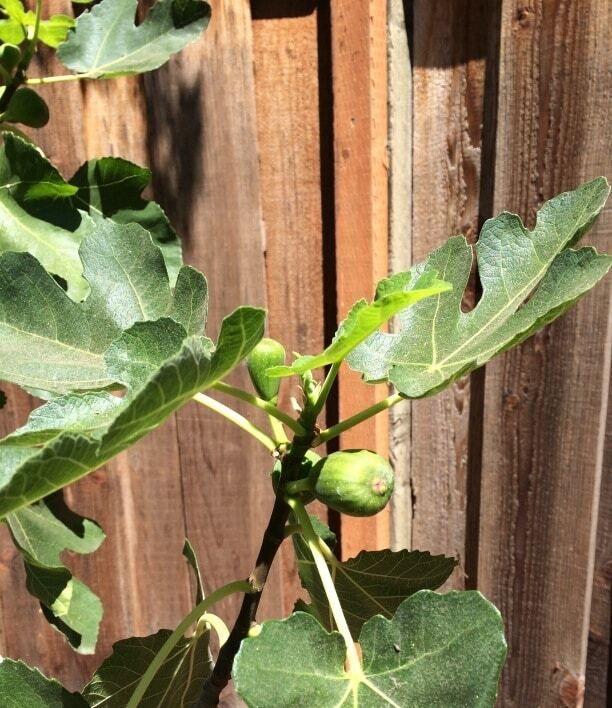 I have a fig tree … this looks like a great way to enjoy the fruit. Very nice. I’m popping over from Pure Grace Farms this morning. Your’re grilled brie stuffed figs looks amazing. This dish has been on my list for months, but I still haven’t managed to try it. Looks amazing! Thanks for sharing. Thank you Suzanne. I hope you enjoy these. Have a great weekend 🙂 . This looks totally amazing. I can only guess how wonderful it tastes. Pinning this one for my next party! Thank you Judee. 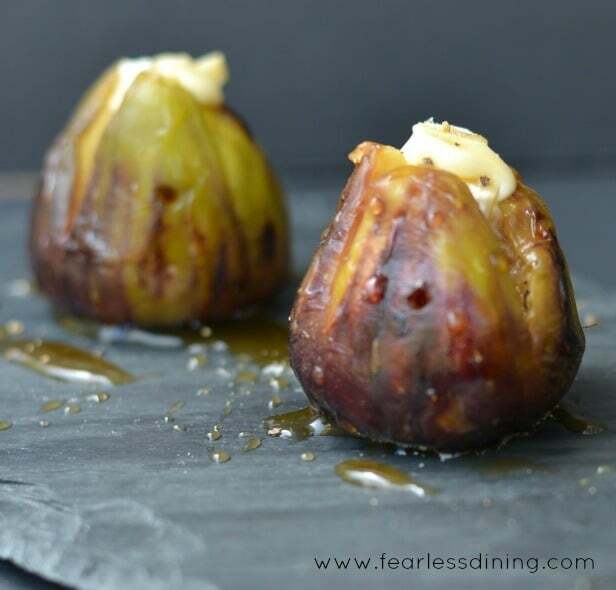 This fig appetizer will definitely make a beautiful presentation at your party. Have a great weekend! I am seeing more and more people using figs in their recipes so I think I need to do some experimenting. These look absolutely fantastic and your photos are so beautiful! I love brie and I bet the combination was addicting! Thanks for a great recipe! Thank you Robyn. Figs are addictive 🙂 I am hoping we beat the squirrels to the ones in our tiny tree this year. Those beasts are awful and my dog doesn’t like to hang outside and guard LOL. I appreciate your comment. Please let me know how your fig experiments go. Hi SandyI wanted to let you know I have included your amazing figs in my Summertime BBQ Side Dish Roundup posting on Saturday morning. Proper links given. Thank you Shari for letting me know. I can’t wait to see the roundup! The pictures look amazing! I love the presentation. The recipe is simple and very delicious! I can’t wait to try it. Figs are coming into season now, so, this will be on top of my list. Thank you Rini. Have you tried the cotton candy figs? They are some odd heirloom variety. There is one vendor, Capay Organics, that have them at our local farmer’s market. They are pretty incredible. These look so good! I haven’t had brie in a long time but now I really want some! Thank you Sharon. My daughter is a brie addict. She went to sleep away camp and left half of a wedge uneaten. I didn’t want it to go bad, which is what got me thinking of things to do with it 🙂 I am glad you like the recipe, have a great afternoon. Hi Sandy, love this post! I am doing a Summertime BBQ Side Dish Roundup and would love to include this recipe. Would that be possible? It is a fabulous idea and one I will hope to be trying soon. Hi Shari, you are welcome to use my grilled fig recipe in your roundup. I appreciate your asking. These are a fun and easy addition to a BBQ menu. Thank you very much. These look delicious, can’t wait to try this recipe. 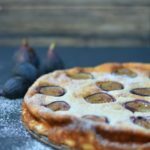 I love figs and this recipe has me yearning for my fig tree’s to ripen fruit for me, SOON! 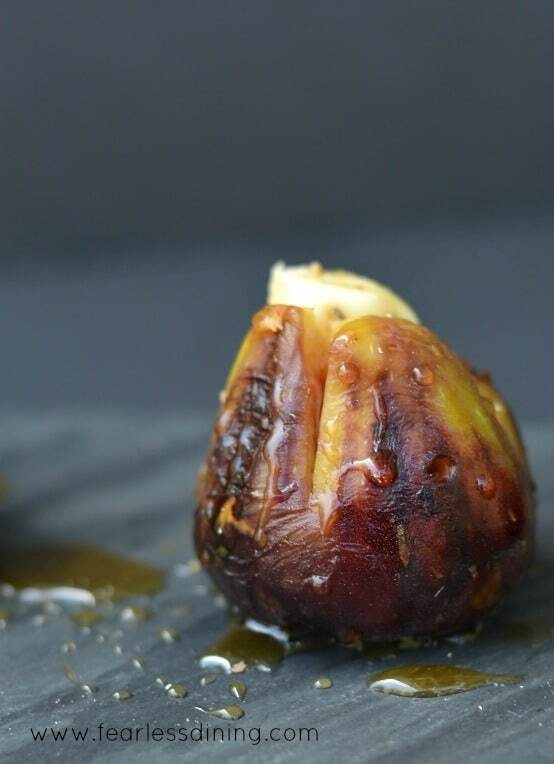 Thank you Debora, I was really surprised how delicious a grilled fig could taste. Please stop back and let me know how yours turned out.